Jailors are guards who work in the dungeons. If you need to visit a prisoner, you can talk to the jailor and he will open the door to the cells and come with you. Sometimes jailors will need to be bribed to gain access to the cells. Unlike other guards, Jailors will immediately attack you on sight if you escape from prison, and will not give you the chance to re-enter jail. They will warn you of this tendency if spoken to through cell doors: "No talking. And, by the way, we execute escaping prisoners. Just a friendly reminder." Although jailors are named according to their respective cities (eg. 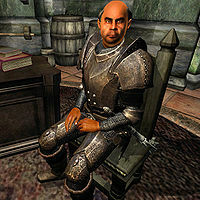 Bruma Jailor), they are all considered to be Imperial Jailors. These guards patrol in a small office. If you choose to go to jail after being caught committing a crime, the Evidence Chest is also found in this room, from which you can retrieve your confiscated items. In doing this you are committing another crime and may be attacked on sight. Obviously, once you have served your time in prison, your stolen items will be returned. Jailors always wear the local guard uniforms and are armed with silver maces. They also carry the cell keys and usually the keys to the nearby castle. Like guards, Jailors also have shifts. When their shift is over, they will proceed to their quarters and swap with a refreshed Jailor to take over their role. If the player has a disposition towards them higher than 70, the jailors will play an unique greeting dialogue instead of their guard one that is "What can I do fer ya, sir/ma'am?" The first RefID and BaseID is for the jailor working during the day, the other is for the jailor working during the night. 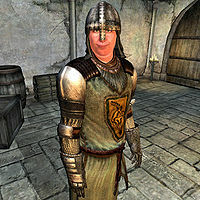 The Anvil jailors wear the standard Anvil guard uniform: a guard helmet, an Anvil cuirass with chainmail gauntlets, greaves and boots. They are armed with a silver mace. He carries the keys to the Anvil Castle dungeon and exterior. They also have a set of lower class clothing and a small amount of gold. The day shift jailor will enjoy crab meat for his dinner while the night shift jailor will enjoy a cheese wedge. 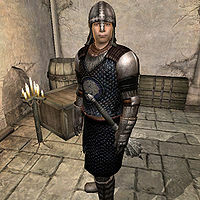 The Bravil jailors wear the standard Bravil guard uniform: a guard helmet, a Bravil cuirass with chainmail gauntlets, greaves and boots. They are armed with a silver mace. They carry the keys to the Bravil Castle interior, exterior and dungeon. They also have a set of lower class clothing and a small amount of gold. The jailor on the day shift enjoys his food, he has an apple, a bread loaf and a carrot while the jailor on the night shift only has a piece of ham. 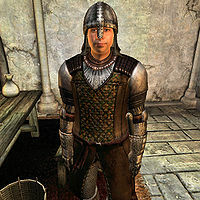 The Bruma jailors wear the standard Bruma guard uniform: a guard helmet, a Bruma cuirass with chainmail gauntlets, greaves and boots. They are armed with a silver mace. They carry the keys to the Bruma Castle interior and exterior. They also have a set of lower class clothing and a small amount of gold. The jailor on the day shift will enjoy grapes for dinner while the night shift jailor will enjoy ham. 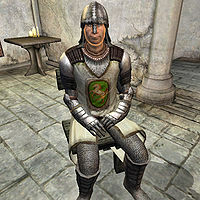 The Cheydinhal jailors wear the standard Cheydinhal guard uniform: a guard helmet, a Cheydinhal cuirass with chainmail gauntlets, greaves and boots. They are armed with a silver mace. They carry the keys to the Cheydinhal Castle exterior and dungeon. They also have a set of lower class clothing and a small amount of gold. The jailor on the day shift will enjoy radish for dinner while the night shift jailor will enjoy mutton. They are both removed from the Corrupt Cheydinhal Guards faction at the end of the Corruption and Conscience quest. 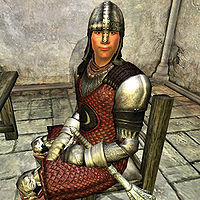 The Chorrol jailors wear the standard Chorrol guard uniform: a guard helmet, a Chorrol cuirass with chainmail gauntlets, greaves and boots. They are armed with a silver mace. They carry the keys to the jail and dungeon. They also have a set of lower class clothing and a small amount of gold. The jailor on the day shift will enjoy rice for dinner while the night shift jailor will enjoy a sweetroll. 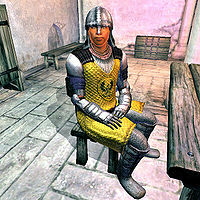 The Imperial jailors wear a legion cuirass, greaves and boots. They are armed with a silver mace. They carry the Imperial watch and prison keys. They also have two pairs of lower class pants and shirt along with a pair of shoes, as well a small amount of gold. The jailor on the day shift will eat a sweetroll while the night shift jailor will enjoy a tomato. 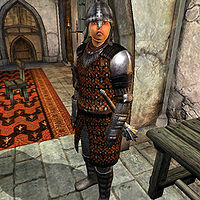 The Leyawiin jailors wear the standard Leyawiin guard uniform: a guard helmet, a Leyawiin cuirass with chainmail gauntlets, greaves and boots. They are armed with a silver mace. They carry the keys to the Leyawiin Castle exterior and dungeon. He also has a set of lower class clothing and a small amount of gold. They both eat an onion for dinner. The Skingrad jailors wear the standard Skingrad guard uniform: a guard helmet, a Skingrad cuirass with steel gauntlets, greaves and boots. They are armed with a silver mace. He carries the keys to the Skingrad Castle exterior and dungeon. He also has a set of lower class clothing and a small amount of gold. The jailor on the day shift will eat a radish while the night shift jailor will enjoy some mutton.